The African elephant is part of the continent's captivating Big Five animals, and is always memorable to observe. The African Elephant is the largest land mammal on Earth, reaching up to 6 tonnes in weight. They are best characterized by their huge size, long arm-like muscles on their face known as trunks and huge ears on the sides of their heads. Most elephants also have large tooth structures that go down the side of their mouths called tusks. Their skin is a grey color all round, with slight crease marks, and a medium sized tail with black hair at the end of it. Their huge size makes them clumsier than other big mammals that resemble them such as rhinos. Their front feet are very round and big, with their hind feet being more oval shaped with toes more distinctively seen on footprints left behind by them. African elephants are found throughout Southern Africa in the scattered region within Botswana, South Africa and Namibia, and even more north towards Zambia, Kenya, Tanzania and into the Sahara Desert. Botswana and the Kruger National Park are some regions where the population has especially flourished due to the dense, luscious nature of some of the forests full of trees they snack on at any time of the day. The elephants here have greatly contributed to controlling the tree growth in these regions, preventing grasslands from being dominated by trees like Mopani trees and keeping the natural balance of flora within the area. Over the past few years, the conservation status of elephants has gone the wrong way, with elephants now being classified as near endangered or threatened. This may be due to continued habitat loss and the enormous amount of vegetation and water required for their survival in the arid African wilderness, along with the negative impact that ivory trade has had on them. Their populations in Southern Africa are still stable, but further north there is less water, meaning there are fewer elephants that can be sustained on the same land. This along with the increasing human population in North African countries and thus their increased water use makes the migration of elephants through the desert harder and harder each year. Their current population is around 470 000 in the whole of Africa. Elephants are frequent visitors in just about any habitat where food and water are available. They sometimes travel over great distances of land and aren't necessarily confined to one area, this goes for elephants within the Kruger National Park. They are however usually found in savanna areas, grasslands, bushveld areas and tropical or equatorial forests with access to enough moisture and sustenance to survive. There are many different habitats in which they are regularly seen in the Kruger National Park, although they are more often seen in greater numbers near denser areas with more trees. Elephants, like antelope and other herbivores, are organized in herds, only they are led by a dominant female known as a matriarch. Elephant herds, however, are more like families, with the members usually closely related and mostly female. The matriarchs of the herds of African elephant more to the north of Africa play a greater role in the survival of the whole herd. They are responsible for navigating the herd on their migration to new water sources in the dry season, and then back again in the wet season. In Southern Africa, their importance in a herd is not that great, but they still decide where the herd travels and navigates them. A herd usually has mothers and calves, again with males when integrated into the group in mating season, and living alone or in bachelor groups the rest of the time. Elephants are among the most intelligent animals in the world. Their high intelligence compared to other animals is distinctive when observing them showing emotions of grief, anger and sadness or playfulness, excitement and happiness. Their memory is also a great amount better than other African animals such as rhinos or buffalo, with some Elephants being reported going back to the scene where a former herd member was killed, and expressing signs of grief while there, even years after it happened. They vocalize or communicate by making a loud trumpet-like sound with their trunks when in danger, when predators are around or just to socialize. Male elephants only start battling for mates when they are around 20 years of age. They reproduce throughout their twenties usually up until 45 years of age. Males, like with other animals, compete for females by fighting, with the losers sometimes getting injured. After winning the battle and mating with the female, a male elephant usually only stays with the female for a few weeks before looking for another partner. Female elephants carry their young for close to 2 years before finally pondering the arrival of a new member of the herd, which will stay there for the next 20 or so years. Elephants, because of their big size and stature, don't really have many enemies or predators to look out for. Lions have been known to kill elephants on occasion, but for the most part, elephants aren't hindered by predators, except when their calves are around. When lions attempt to attack a member of a herd, the elephants also form a circle like formation to keep calves safe in the middle, while older, stronger members fend off lions ruthlessly, also sometimes killing one of them. Their strong trunks are a very useful weapon and tool in most situations and are arguably key to their survival. South Africa's top travel destinations are Kruger Park and Cape Town. 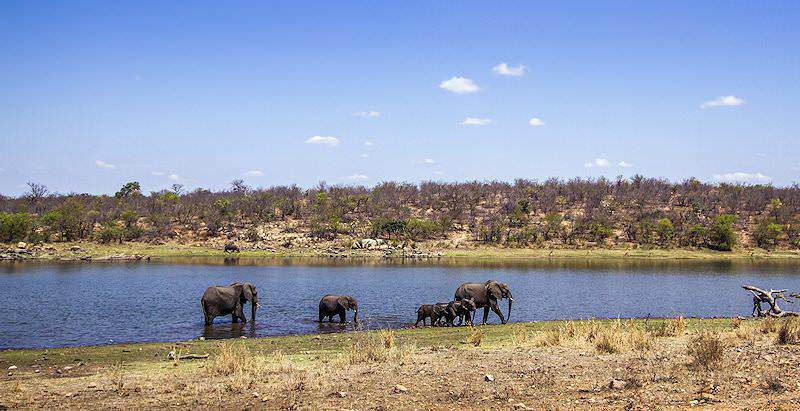 Travel to Botswana for the ultimate African safari vacation. Namibia's most rewarding safari destination is Etosha National Park. Zambia is an exceptional safari destination replete with wildlife. Mozambique boasts 1000km coastline dotted with alluring beaches. The Kruger National Park is an enormous wilderness with multiple exclusive private game reserves along its unfenced western border. The Sabi Sand Private Game Reserve is famous for the extraordinary frequency of leopard encounters within its wild borders. Cape Town, South Africa's beloved 'Mother City' will appeal to a wide variety of discerning travelers, from thrill-seekers to those after some relaxation. The Garden Route region is a captivating stretch of forest-lined coast in South Africa's Southern Cape area.